Growing Greens is our original one size organic diaper, fitting most babies 5-35 lbs. The two part organic diaper system is constructed entirely from the softest organic fleece knit, 100% unbleached organic cotton thread and natural rubber elastic. Our unique non-PVC, hypoallergenic snap system offers wide adjustment for thigh and back allowing a custom fit. The functionality of the two part snap in design creates a trim, multi-fit diaper that enables a thorough cleanse and quick drying time. Each Growing Greens diaper includes our unique contour that features an umbilical cord cutout to promote healing for those first few weeks. Used alone, contours will fit newborns 5-10 lbs. 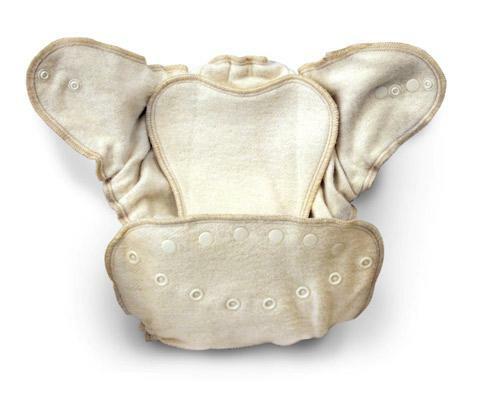 As your baby grows, use the fitted diaper alone with the front folded down, customizing the rise and exposing a hidden row of snaps fitting 10-18 lbs. For toddlers, 18-35 lbs., Growing Greens can be used with the snap in contour for increased absorbency. A doubler can be added for night or naptime. Cotton is the most heavily sprayed crop in the world next to coffee. Babee Greens organic cotton diapers are made from organic cotton responsibly grown and milled in the U.S.A, without the use of harmful pesticides and chemicals, so you’re putting the softest and best fabric possible next to your baby’s skin.